Global powerhouses Paradise Dynasty and Din Tai Fung expand reach in U.S.
A Singapore-based soup-dumpling darling is planning its first U.S. restaurant, a move that is sure to trigger a dumpling war between two of the biggest brands in the world. Paradise Dynasty, which has locations in nine countries, is looking to open a restaurant in Los Angeles as early as 2019. The brand has a global following that rivals the more traditional and domestically established Din Tai Fung of Taiwan. Related: A look at the dumpling competition in the U.S. The most popular of 10 brands operated by Singapore-based Paradise Group Holdings, Paradise Dynasty is known for its eight multi-colored and unconventional soup dumplings. One of the most decadent features black-hued dough stuffed with foie gras and black truffles. “We are pretty confident that the U.S. market will like and accept us,” CEO Eldwin Chua told Restaurant Hospitality in an exclusive interview. Paradise Dynasty is entering Southern California at time when modern dumpling houses serving xiao long bao, or Shanghai-style soup dumplings, are popping up all over the West. The dumpling specialists are riding the coattails of Taiwanese powerhouse Din Tai Fung, which popularized soup dumplings after debuting in the U.S. in Arcadia, Calif., in 2000. Din Tai Fung, which operates nearly 160 restaurants around the world, from Dubai to Australia, has grown to 11 locations in the U.S., and more are in the works. The family-run empire of dumpling houses recently said it would open in Portland, Ore., and San Diego. Later this year, a London outlet will open. When Din Tai Fung opened its first U.S. restaurant, the international sensation set out to change American perceptions of Chinese cuisine by introducing diners to an upscale dumpling house. “We are happy to see that other similar concepts have opened, as this growth further helps associate Chinese cuisine with high quality, authenticity and upscale dining,” said Albert Yang, whose grandfather opened Din Tai Fung as a cooking oil retail shop in Taiwan, in 1958. In 1972, the store was transformed into a restaurant specializing in soup dumplings and noodles. The elegant, best-in-class dining venues have since expanded to Japan, Singapore, South Korea, Australia, Indonesia, Malaysia, Macau, mainland China, Thailand, Hong Kong, the Philippines and Dubai. Yang and his brother Aaron, both graduates of Cornell University’s School of Hotel Administration, run day-to-day operations in the U.S., where they have established the company’s dominance. When Din Tai Fung opens restaurants, diners descend on each location with wait times reaching up to two hours. In the dining room, customers are treated to a show, as dumpling masters fold hundreds of the juicy wonders in an exhibition kitchen. The hand-folded, thin-skinned dough is filled with meat, often ground pork, and gelatinized stock. The stock liquefies upon steaming, creating a juicy burst with every bite. Los Angeles chef Vinh Nguyen, who plans to open a dumpling concept called Stay Lucky in Southern California, called Din Tai Fung the “gold standard” for traditional dumplings. 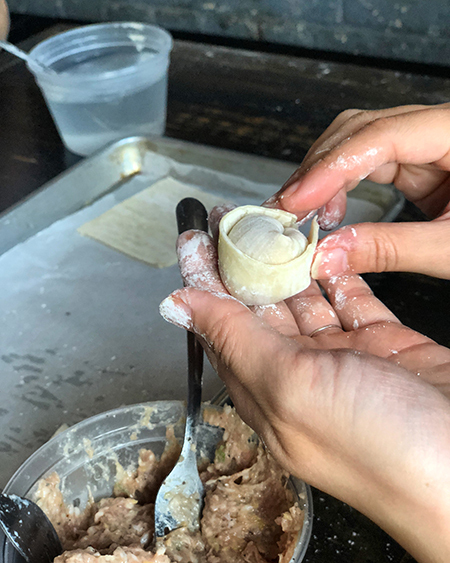 To differentiate Stay Lucky from traditional concepts like Din Tai Fung, Nguyen plans to specialize in a hard-to-find dumpling called sheng jian bao. It’s a love child of three Chinese favorites: a soup dumpling, a steamed bun and a potsticker. “It’s the hardest dumpling in the world to make,” Nguyen said. But if anyone can perfect it, it’s Nguyen. He spent three years in Shanghai studying Chinese cuisine. Before that, he worked at legendary Southern California gastropub Father’s Office. He has spent months folding hundreds of dumplings under the guidance of renowned dumpling experts including Gary Wang, co-founder of The Grumpy Pig in Shanghai. The pork-centric restaurant served expats and locals from 2011 to 2016. Wang’s passion for pork dumplings is well documented. He was featured on a dumpling-themed episode of David Chang’s Netflix series “Ugly Delicious.” The fact that the Momofuku restaurateur and chef is showcasing dumplings on his rookie show underscores the everyday popularity of the item, which in the past had been sequestered to dim-sum carts on weekends. But there’s a reason why dumplings haven’t been an everyday staple on mainstream Chinese menus. Dumplings are equivalent to labor-intensive foods found in other cuisines, from Mexican tamales to hand-rolled Italian gnocchi. “Not everyone can make dumplings by hand,” said Allan Tea, owner of Paper Lantern in Irvine, Calif. Tea, whose family runs a string of Chinese restaurants in Southern California, has seen demand rise for dumplings over the years. Hoping to be the Ray Kroc of dumplings, he struck out on his own and created Paper Lantern last year as a fast-casual, approachable eatery. No dim-sum cart. And, more importantly, no need to bring “your Chinese friend from college” to help you order. “We’re not a super-Chinese restaurant, where the menu is only in Chinese. We’re also not a place where you wait a long time to order,” Tea said. Still, despite its location within an always-crowded Asian-themed retail center in Irvine, Calif., Paper Lantern is pivoting its business model. Instead of growing the concept, Tea said he’s discovered a better revenue stream by selling dumplings to other restaurants. He’s in the process of expanding Paper Lantern’s central commissary to meet wholesale demands from restaurants looking to add the hard-to-make item to their menus. Tea said some of his biggest orders are coming from hotel-based restaurants in Southern California. The craftsmanship of the humble dumpling is one of the reasons why it’s gaining notoriety in the U.S. Diners educated by the Food Network and world-traveling chef Anthony Bourdain are looking for authentic and unusual dining experiences. That’s where Paradise Dynasty steps in. The Singapore-based restaurant serves eight kinds of soup dumplings, and the skin of the dough comes in hues of black, red, green, yellow and orange. Flavors include crab roe, ginseng, garlic and cheese. Each skin is “dyed” using natural colorings from ingredients such as beets and spinach. “We bring a different variation to the market,” CEO Chua said. Paradise Dynasty knows how to conquer regions. It operates nearly 100 restaurants under 10 different brands throughout Asia. Paradise Dynasty is the company’s first concept to enter the U.S.
Chua, who wants to put Paradise Dynasty in major U.S. markets, acknowledged that the restaurant will be going head-to-head with several competitors beyond Din Tai Fung. To name a few: 18 Folds is billing itself as a “farmhouse” dim-sum eatery with a self-serve sauce bar. It opens next week in the Anaheim Packing District, a Gen-Y-friendly culinary mecca in Southern California. Another international interloper headed to the region is JA Jiaozi. The Chinese chain specializes in Beijing-style steamed and boiled dumplings. It’s opening its first American outlet in Irvine, Calif., later this year. My Little Dumpling, created by one of the founders of Los Angeles Chinese chain Chin Chin, is also coming soon to the area, according to Eater LA. The craze is not limited to Southern California. Other modern indie concept where dumplings take center stage include Yong Kang Street Dumpling & Noodle House in Las Vegas and Brooklyn, N.Y., and Dough Zone Dumpling House in the Pacific Northwest. But Chua is not worried. He said competition is good for business. Besides, how much more competitive can it be than trying to sell dumplings amid hundreds of rivals in Asia, especially Shanghai. “As compared to Asia? There’s no comparison,” he said.